Discussion in 'General Discussion' started by Anonymous, Feb 7, 2019. Note: The Strange 90's Facebook page image lists "Members of" Morrissey (Matt Walker) in the details. Charity Bomb announced on Wednesday (Feb. 6) the Strange 90s benefit concert. All proceeds from the event will benefit Jerry Bryant of JBTV's cancer treatment fund following his diagnosis with stage 4 colorectal cancer. Morrissey, Plain White T's Naked Raygun, Andrew W.K., Local H, members of Kill Hannah, Stabbing Westward, OURs, Broken Hope and MS MR are all scheduled to perform, with additional artists to be announced in the upcoming weeks. The Emmy award-winning host's doctors are optimistic that they've removed the cancer, according to the event's press release, and Bryant is undergoing a six month chemotherapy treatment just to be sure. However, due to his limited insurance coverage, medical bills are continuing to add up. Fans can donate to help via JBTV Health Awareness or Strange 90's: Jerry Bryant Cancer Fund. "Jerry wants everyone to know that although these obstacles are difficult and there's a lot of trials to come - he's committed more than ever to helping artists and exposing new music," Michael Harnett, president of JBTV, said in a statement. 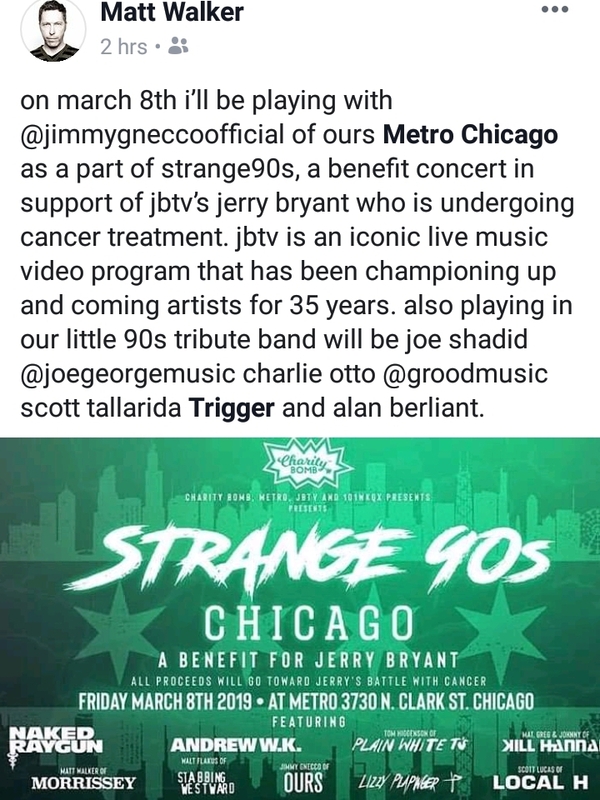 Strange 90s is taking over Metro Chicago on March 8. Tickets are available for purchase here. Jerry Bryant is the best. Hope he gets better. I'd guess at Matt doing his Bowie routine. The billing poster is marketing gold. I tried and failed to get into the meet and greet Jerry hosted with Morrissey during the Your Aresnal tour. His show is always weird and wonderful. I wish him well. hope its a success and they raise a lot of money for the guy.M should appear and sing LOVER TO BE,then again the rodents on here would say he was cashing in on someone elses illness. Is ‘morrissey’ a band now..
Hasn’t he always referred to himself and his band as a ‘we’? IE ‘we have a new album ‘ etc. Matt Walker and the bands he's had over the years have made some great music. The MDR (Most Dangerous Race) had some great songs.